June is upon us and grilling season has started. 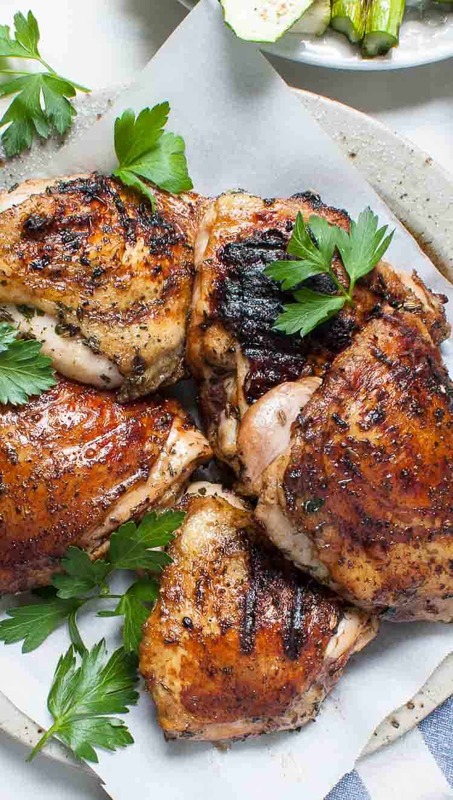 Time to fire up the charcoal and soak some thighs in this simple chicken brine. 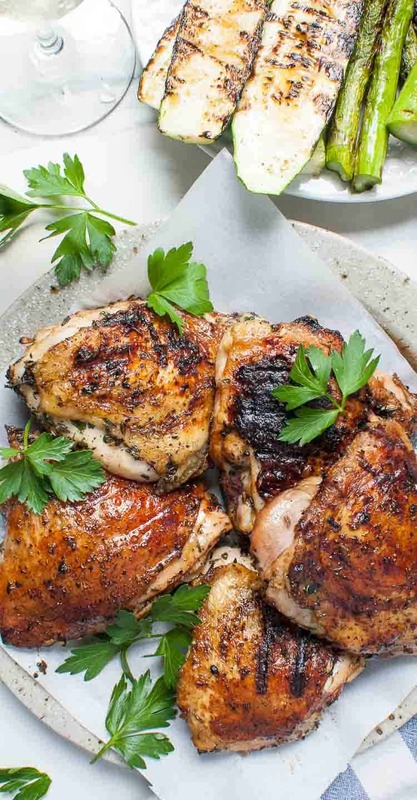 You’ll be amazed at how flavorful, tender, and juicy this chicken becomes. For this flavoring, we used my traditional Italian style seasonings: garlic, basil, thyme, oregano, and fennel. These ingredients get put into a small saucepan along with water, salt, and sugar, and get boiled and made into an herbal tea of sorts. All the great flavors in the seasonings are infused into the water and as the chicken soaks, all this goodness gets absorbed. It becomes a pot of flavor goodness. How Long Do You Brine Chicken? These tasty chicken thighs were brined for 3 hours. If you’re brining skinless, boneless breasts, 1 to 2 hours is adequate. Skin on, bone in chicken, 2 to 3 hours. A whole chicken should be brined 3 to 4 hours. Any longer than this, the chicken will get too salty. Use the time you have…it all adds up to added flavor! A brine is unlike a marinade. Some thicker steaks are left in the refrigerator to marinate overnight, using an acid based marinade. If you leave meat in a brine overnight it will…#1. get too salty and, #2. the watery brine will actually start to pull out some of the natural flavorings of the meat. You don’t want that. These thighs were put into a gallon ziplock bag with the brine, placed in a suitable sized bowl, and refrigerated for 3 hours. To prep them for the grill, remove from the brine and pat dry. Very lightly oil the skin with olive oil, then grill, skin side down 7 or 8 minutes to get a nice char. Turn and let cook 10 or 12 more minutes until the internal temperature is around 160°F. Let the chicken rest for 5 or 10 minutes, then serve it. The chicken brine will have done it’s work! The flavor of the herbs in the meat is amazing. MaryJo even mentioned that this was the tastiest chicken I have ever made. Simple chicken brine…that’s good enough for me. 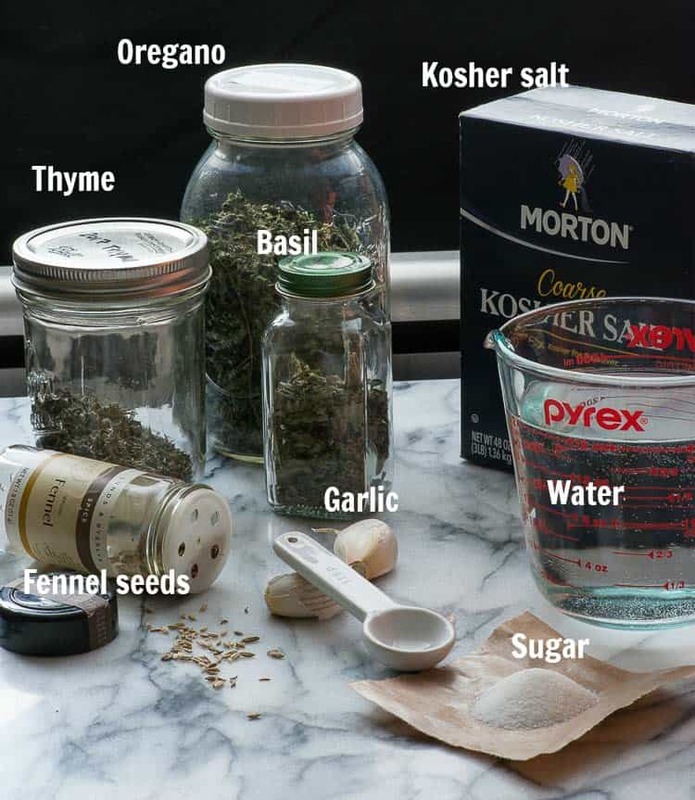 This is a salty brine, filled with herbal flavors, to moisturize and enhance grilled chicken. 1/4 cup Morton coarse Kosher salt, (approx. 66 grams) If using fine table salt, use 1/8 cup or 66 grams. 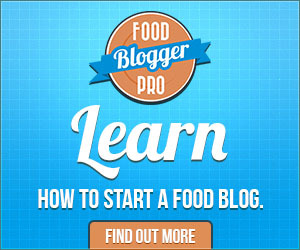 Place all ingredients into a small saucepan and bring to a boil. Stir to dissolve the salt. Reduce to heat to a low boil for 2 minutes. Remove from the heat and let cool. I placed the saucepan into an ice bath prepared in a skillet. In 10 minutes the temperature of the brine was less than 100°. Place the chicken pieces into a covered bowl or ziplock type bag and cover with the brine. 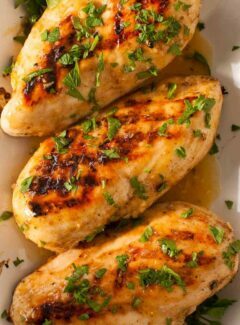 Refrigerate 1 to 4 hours depending on your chicken. 1 to 2 hours for boneless, skinless cuts. 2 to 3 hours for skin on, bone in cuts. 3 to 4 hours for a whole chicken. Remove the chicken from the brine, pat dry and lightly oil. A bit of pepper may be added at this time if desired. 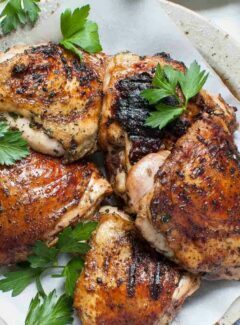 Grill the chicken until the internal temperature is around 160°F. 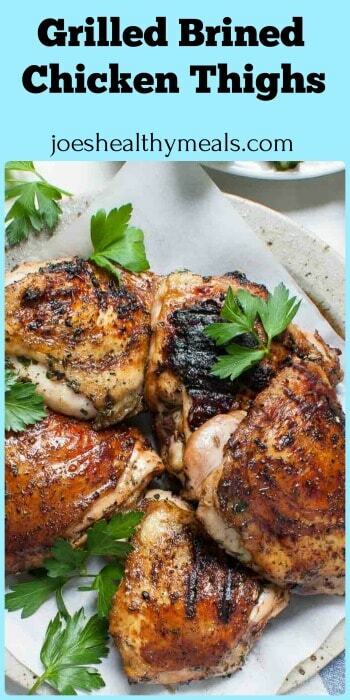 To brine a whole chicken, you may need to double the recipe to fully immerse the chicken. Mine was so salty! I followed the recipe exactly. What went wrong? I checked 3 times and it said nothing about rinsing the chicken after brining. Hi Gail, Sorry the brine didn’t work for you. All I can think of that could go wrong is if you used fine table salt rather than Kosher salt. Table salt weighs twice as much as Kosher salt so the brine would have double the amount of salt. I’m going to make that note in the recipe card right now. Thanks for the comment. 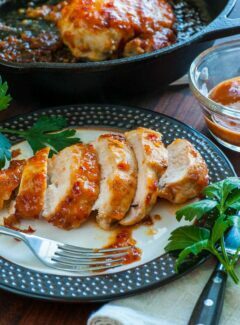 We’ve had this recipe twice now, and both times the chicken came out so tender I couldn’t believe it ! This is the only way to do chicken on the grill, for sure! The fennel gives it a nice flavor. Next time I might use fresh herbs with the brine. Thanks for the recipe! Wow, do those thighs look good! They happen to be my favorite part of the chicken and your picture makes them look so darn good I could take a bite out of the picture!!!!!! That brine is absolutely on our list for our next grilled chicken (which is coming very soon). Thank you Joe! I’m not an expert on chicken, so I’m wondering could you just bake this after brining or does that defeat the purpose? Thanks! Hi Lauren. 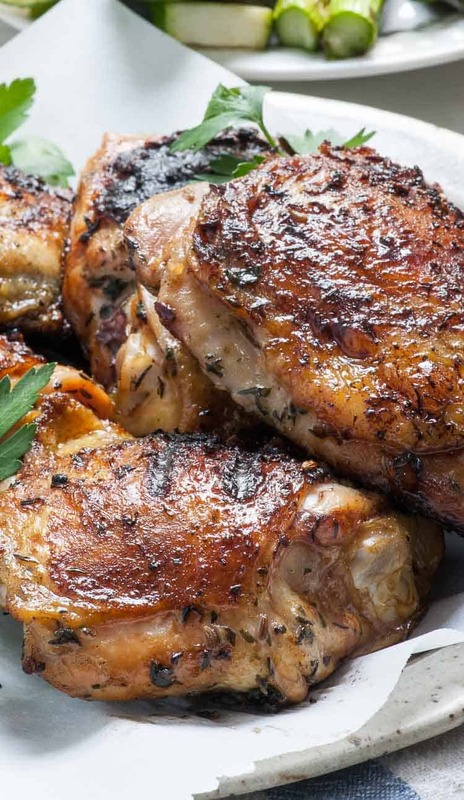 You can definitely bake the chicken rather than grilling. The flavors will still be great. Thanks for the question. Joe, I am going to have to try this!! Your pictures had me drooling and I love those seasonings you used! I can’t wait to taste this recipe! Thanks Megan. The brine sure adds another level of flavors. I swear, this was the best grilled chicken I’ve ever had! This is the only way to prepare chicken on the grill.